Broome County Emergency Services (BCES) announced, Tuesday morning, a new program has been implemented for local 911 dispatchers to address mental health emergencies faster. 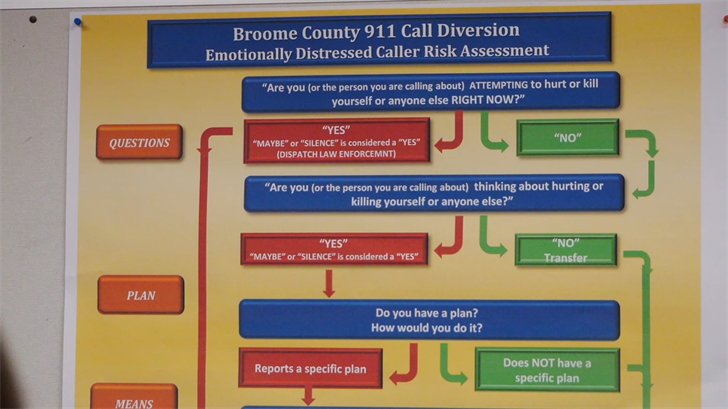 It's the first initiative of its kind in New York State, utilizing a direct connection between Broome 911 dispatchers and mental health counselors. The Mental Health Diversion program has changed the approach of first responders. When 911 operators receive emergency calls involving mental illness, dispatchers follow a series of questions. If the level of harm to the caller is substantial, law enforcement and EMS will make direct contact with the caller and transport them to an emergency room (sometimes waiting with the caller for hours), but if the call can be assessed as mentally non-life threatening, dispatchers can directly reach a counselor at area hospitals, 24/7. According to Crisis Intervention Team coordinator Michael Hatch, 1 out of every 10 calls to Broome's 911 center is related to mental health. Before the new program was first used in December 2017, the protocol for a mental illness call was to send law enforcement and EMS to the caller's residence, no matter the threat-level. "[Now] the program not only provides better immediate care to the caller, but it also keeps the caller out of the rear of a police car," said Michael Hatch. Director of Emergency Services Mike Ponticello said this new program "adds a new tool in the toolbox" of mental care. He reaffirmed that by utilizing important services, the Mental Health Diversion program will allow the immediate treatment and care for individuals seeking mental and emotional wellness, as well as keep law enforcement agents in the field for the public's service. Funding this new project, Care Compass partnered with other agencies to address a more immediate response to mental health. Callers that meet certain criteria will now be transferred to UHS Comprehensive Psychiatric Emergency Program (CPEP) and other mental care facilities, staffed with psychiatric specialists, social workers, and nurses under the care of a medical doctor.